Fully permeable paving with out the maintenance and risks of loose gravel on a public footpath. For this reason Councils Australia wide have specified StoneSet, Australia wide. StoneSet uniquely has the highest porosity rate compared with other complete, rigid paved surfaces. We optimise porosity with strength/durability by using a 6mm stone which is large enough to form multiple strong cross-linked bonds forming one solid matrix for longevity and durability. This 6mm stone size leaves voids large enough to afford a porosity rate of 103 Litres/sqm/min – Essentially as porous as grass. 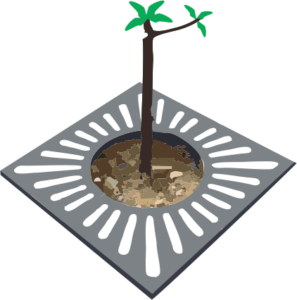 Metal Grates are often expensive to manufacture, especially in small quantities for additional requirements down the track. Loose Stone and Mulch style tree surrounds are quite common as they are the most affordable option for tree surrounds. However the immediate issues with loosely filled tree surrounds is the erosion and damage caused by high foot traffic spreading the debris outside of the tree pit. Soft fall rubber is not porous, so not great for tree surrounds. 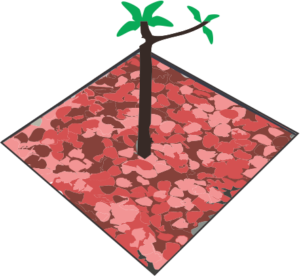 It is sometimes used as the roots need to move, however UV damages the rubber over time and accelerates the wear of UV hitting the surface constantly. Accordingly Councils in every state across Australia have used StoneSet tree surrounds for public areas. 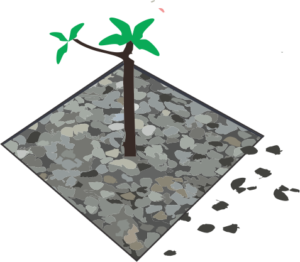 For new Permeable tree surrounds, we require a porous base layer of compacted crushed rock. Typically this applied around the tree before StoneSet permeable paving is applied 30mm deep over the top. 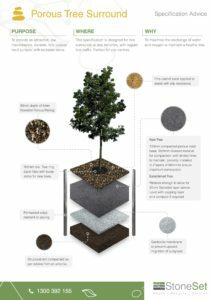 For established trees StoneSet permeable paving can simply overlay at a depth of 30mm, provided the existing base is compacted.